Home » india news » Big Brother: why does the govt want to set up a media monitoring cell? In a possibly Orwellian move, the NDA regime is mulling setting up a National Media Analytics Centre and another "media cell" to provide a counter-narrative to the content it deems "provocative" or "offensive". 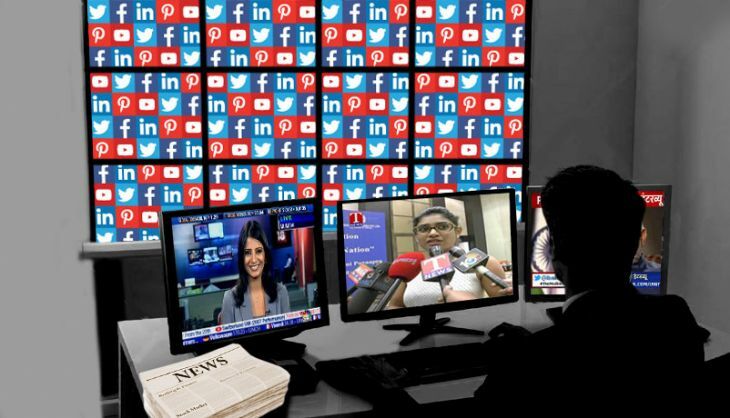 According to a report in The Indian Express, the proposed NMAC "will be created to monitor and analyse round-the-clock blogs, web portals of TV channels and newspapers, and social media platforms such as Facebook, Twitter, Instagram and YouTube, among others." The report says the NMAC proposal is based on tracking software designed by Ponnurangam Kumaraguru, an assistant professor at Delhi's Indraprastha Institute of Information Technology. Kumaraguru could not be reached for details. But Kuldeep Singh Dhatwalia, a senior official in the home ministry told Catch: "It is just a concept right now." Such a move, however, raises serious questions on the intentions of this government. "During my term as the minister, we had set up a new media cell to ensure that the government's viewpoint is adequately represented on social media," says former I&B minister Manish Tiwari of the Congress. It was set up in response to the massive anti-corruption protests led by Anna Hazare in 2011-12, when the resentment among the masses was channeled through social media. The UPA 2 government's practice of handling "offensive" material on social media by slapping Section 66 A of the IT Act against the "offenders" had led to widespread resentment and added to its unpopularity, especially in urban areas. According to Tiwari, the cell his government had set up is adequate enough to push the government's viewpoint. Tiwari also points out how each department now relies on twitter accounts, besides the Press Information Bureau to disseminate the government's stand on various issues. Prime Minister Narendra Modi, too, has been a regular user of Twitter since his days in Gujarat. "It is fine if the intention is just to correct the misinformation. But if you dovetail such a mechanism with the intelligence agencies, and start profiling journalists, then it assumes an Orwellian structure of intimidation and coercion," Tiwari points out. The Indian Express report says "the software would also help recall the past pattern of the writer to check the number of times he took a negative or positive stand, his background and preferences of websites and areas of interest to judge whether they were aimed at fomenting trouble or radicalisation." There's also a suggestion that the proposed centre will pass on the relevant information to the security agencies. A former top intelligence official says there is no need for a new mechanism when the agencies already have sufficient tools to track the journalists. "The government may just be testing waters by floating the idea," the official feels. "Every intelligence agency, including ours, have dedicated psy-ops and disinformation wings to push the agenda of the state," he points out. Indeed, psy-warfare is an age-old tactic of all intelligence outfits. This official says setting up a new body will only lead to more confusion and if it is set up under the home ministry or the National Security Secretariat, then it will only suggest that the intention of the government is much more than just keeping a track of the content. Dhatwalia, however, insists that a nodal ministry for NMAC has not been decided yet, pointing out that it's still in its evolutionary stage. "We know that the reputation of the media, especially TV, has taken a beating. It is because they are giving space to non-serious and unqualified people," the former intelligence official says, pointing out that a regular commentator on national security for a leading English news channel has only a few months' experience of working in the army's intelligence wing, that too at a very low level. "Those debates are a sham but the course correction should be left to the media and shouldn't be done through agencies of the government," he adds. Apart from this, there's a feeling the move could only expose the insecurities of the government and send a wrong message. "If this turns out to be a mechanism to intimidate the media," Tiwari says, "then we will certainly oppose it."